Long Island has one Muffler Man on it’s shores. 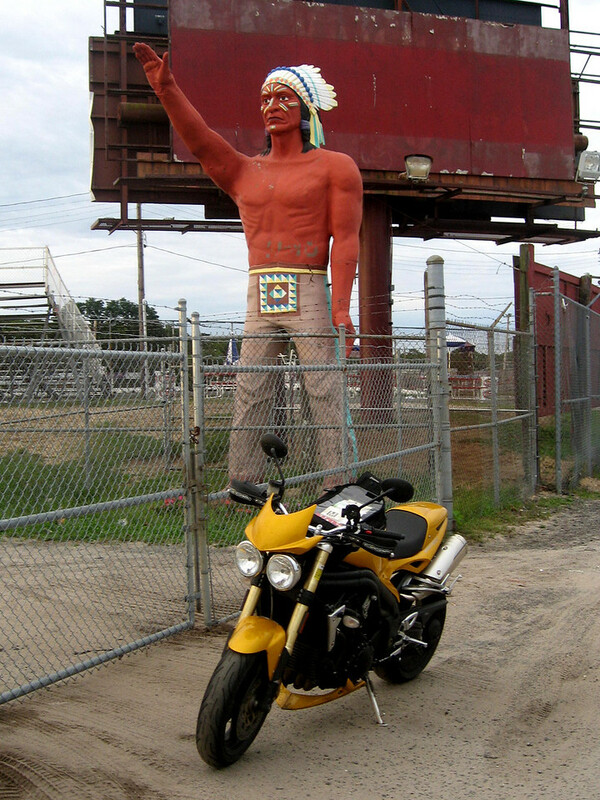 It is an indian-style man that stands outside of the Riverhead Raceway oval where he’s been waving to the traffic since the 1970’s. He’s always visible. Why not stop by and say how…err, Hi? Fun Fact: This particular muffler man was once featured in a scene of the Sopranos. Visit Roadside America for more tips for the Riverhead Muffler Man. Cool. You were the first to alert me to this landmark in an earlier post and I made a special trip out to Riverhead to see it, at which time I remembered it from an earlier visit to the raceway. It has been a long time since i saw that . Thanks for the momories. Ahhh that one is awesome. Need to get a picture of me doing the same pose below it. Maybe next time when I’m driving someone to the outlets because Surise Highway is just the most dreadful ride ever.